The Junta de Castilla-La Mancha have announced that they are to open a breeding centre for Iberian lynx in the Parque Nacional de Cabañeros. Meanwhile, they have also released a photo of lynx they claim was taken in front of an automatic camera last Thursday and did not run although the the flash continued to fire. (El Pais) The Junta have also released figures for the population in CLM – 3 breeding females, 2 males, 4 sub-adults and 6 cubs. 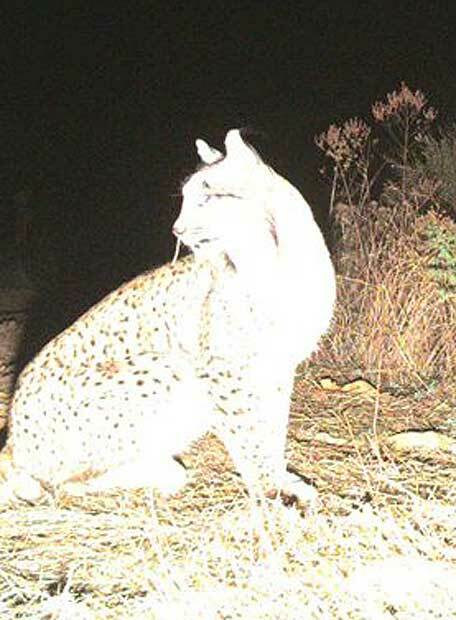 The lynxes are somewhere in Ciudad Real and may be animals which have dispersed from Sierra Morena in Andalucia, and perhaps mixed with a relict population in CLM. This would be very good news as it would mean that the Sierra Morena lynxes are expanding more than previously believed.